Physical description: About 9 to 12 mm in length. 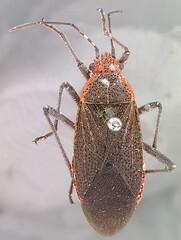 Brownish black dorsal side with yellowish orange head and similarly colored, but more reddish, sides of the pronotum. Hemelytra have lighter colored sides. Ventral side is brown and but the posterior ends of the abdominal segments are red. Appendages are black. J. pectoralis has been found in Brazil and Uruguay, but the exact locations of where it was collected are not known. Our range estimate for this species is especially limited because we do not know what host plant it uses and have only one recorded collection point.